My experience with M(^a^)ki-san reflects a real, unusual, extraordinary relationship. This is a 'half-sponsored post', because my beloved and I returned second time with complimentary food after our initial unsavoury experience in their outlet. The experience has nothing to do with the quality of their food— I must admit that the ingredients that Maki-san uses are fresh and makes you wanting for more. In my virgin experience with Maki-San, I was taken aback by a response from one of Maki-San's service crew. It is in my blood to snap away shots of establishments and pictures of food to share with my readers. Seeing that Maki-San has a very elaborate and artistic storefront, my beloved politely asked for permission to take some pictures. The crew member hastily replied 'no cannot', which seemed rather crude and rude back then. I shared on Instagram that I wouldn't be going back there. I was touched by their after-service where Omar Marks, the co-founder of Maki-San, personally explained in an e-mail about the possible dedication of his staff. The incident is a long story and I wouldn't want to bore you with the complications of a personal narrative, so back to the focus of their food. Maki-San prides itself in customising your very own sushi comes in 6 easy steps. Fill up the order form at their storefront and your tastebuds are on for a gratifying roller coaster. I ordered traditional nori (seaweed) with healthy brown rice, shredded carrot, dried cranberries, avocado, sliced cheddar cheese, steamed ebi, smoked salmon, pine nuts and Yuzu Sesame. I really loved this combination because it brings about the flavours of sweetness and sourness, crunchiness and saltiness, all at once. Every bite was full of new flavours and I felt like I was introduced to sushi for the first time. I loved how the food was served slightly cold. The following review is for my second visit to Maki-san. In terms of consistency, the food still tasted as fresh. I ordered House Sushi the second time round thinking that it might be carefully handpicked by the sushi artiste. Keep on Shrimpin' comes with Healthy Soy, and it appears that wrapping the sushi with Healthy Soy is more difficult for the rice to stay together. 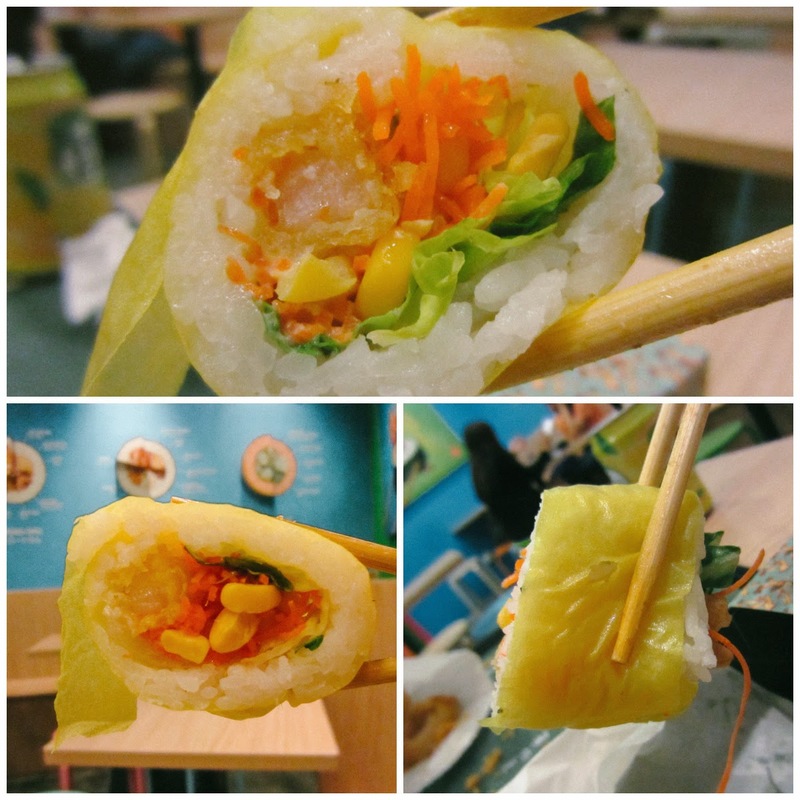 There was a slight sweetness to the wrap, but I would prefer the traditional Nori (seaweed). Quack Quack! contains duck and sweet potato glass noodles. It was very filling for two people as Maki-san was very generous with their portion. It really reminded me of Prosperity Toss ( Lo Hei / Lou Sheng) during Chinese New Year. This is a rather different rendition of salad, but nevertheless, it was really unique. I'm a crazy fanatic of duck. The smoked duck used by Maki-San was thick, juicy and chewy. It isn't oily at all and I felt so healthy eating it. You can select one out of three dips for each snack order, namely Japanese Mayo, Smoky Cheddar Cheese and House Paprika Seasoning. Each snack comes in a stick enclosed in a paper bag. The onion fried in batter was one of the best I ever had. I really loved the smoky cheddar cheese, though it didn't taste smoky at all! I will definitely return to Maki-san again in their coming new outlet, so stay tuned!